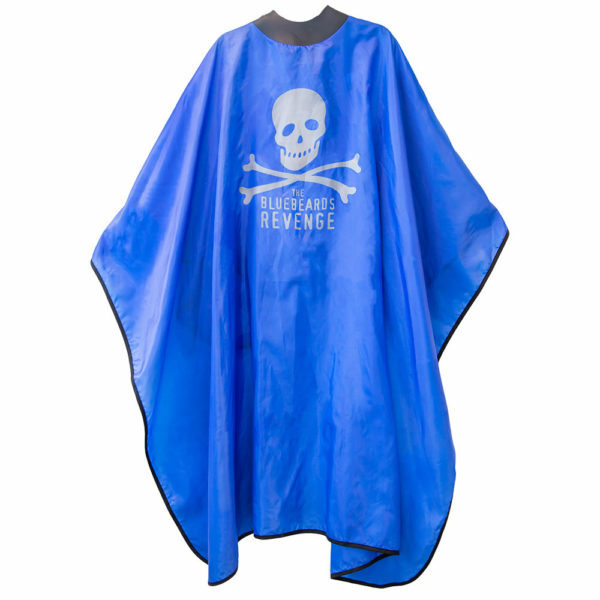 The Bluebeards Revenge Neocape is a full length, machine washable, Teflon-coated gown that features an evolutionary neoprene seal. This innovative seal prevents hair, water and other unwanted irritations from falling down the necks and backs of clients – an unwanted side-effect of previous trips to the barbershop. Thanks to this seal, customers can now leave the barbershop with a fresh cut, clean clothes, and no irritation from hair splinters! The neoprene collar is designed to be tough on liquids and hair, while delivering a soft and comfortable fit for clients. Six adjustable poppers and the flexibility of the neoprene combine to make sure the gown fits effortlessly around the smallest and largest necks. 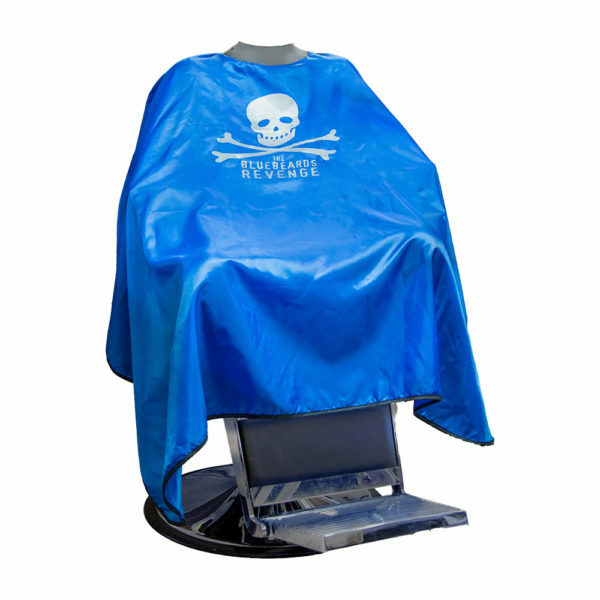 Finished in the classic Bluebeards’ blue and featuring the brand’s iconic skull and crossbones logo, this barber cape is sure to stand out in any barbershop/salon. 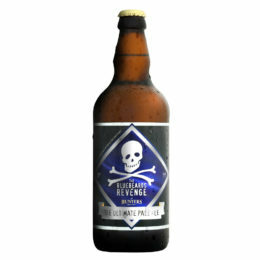 The Bluebeards Revenge Neocape is an all-British collaboration between The Bluebeards Revenge and professional hair technology manufacturer Neocape. 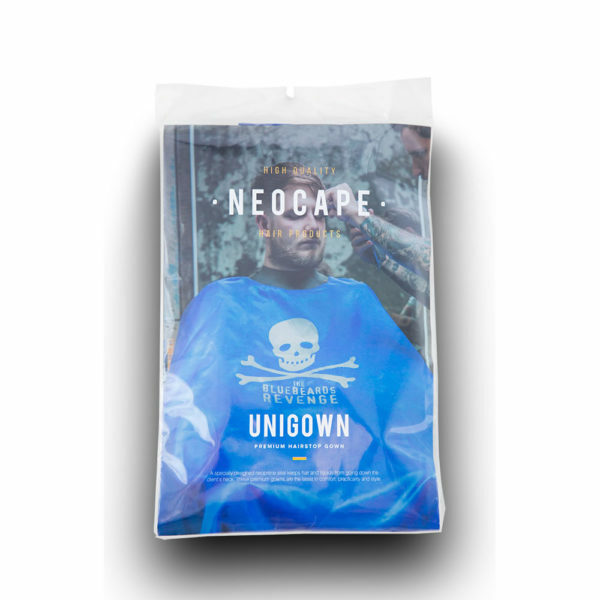 For more information on the Neocape brand, visit neocape.co.uk. 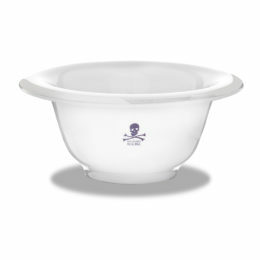 Features a neoprene seal that stops hair and liquids from irritating the necks and backs of clients. Replaces a standard barber cape. 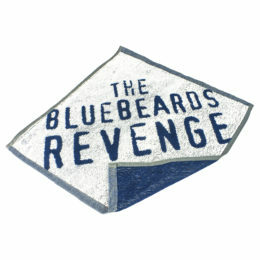 Features The Bluebeards Revenge logo. Six adjustable poppers combined with the flexible neoprene means the gown fits easily and comfortably around the smallest and largest necks.